Due to popular demand we have compiled a summary of all Rointe Kyros Electric radiator sizes for quick comparison. These include the standard Rointe Kyros electric radiators and the low profile Rointe Kyros electric conservatory radiators. 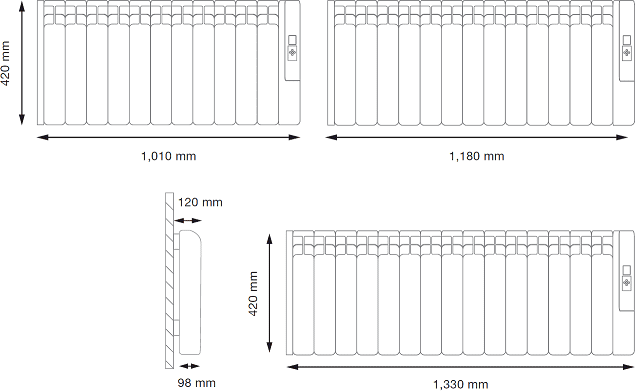 All of the standard Kyros radiators are a standard 580mm in height and 98mm in depth. They are designed to be bracket mounted - therefore the depth after mounting is a consistent 120mm. The KRI0550RAD 5 Element Electric Radiator with 550 watts is the next size up in the range - this is generally used for small rooms or used in conjunction with another electric radiator to give optimum heating. However on its on it can heat a room up to 5m². The Kyros conservatory radiators are a standard 420mm high - for low-level walls and 98mm in depth. They are designed to be bracket mounted - therefore the depth after mounting is a consistent 120mm. Using our handy room size calculator we can calculate which electric radiator(s) is most suitable for the space in which you require to heat. What will affect the size of my chosen radiator? Insulation - how well your properly is insulated will have big impact on the wattage required for the rooms in your home. A poorly insulated room will theoretically lose more heat, requiring a larger wattage to compensate for the extra heat loss. It is recommended that where possible insulation such as double glazing, cavity wall insulation and loft insulation is overhauled to save money on your electricity bills long-term. Ceiling height of the room - the average ceiling height is 3.5 meters. In a Victorian property for example ceilings are higher and heat loss calculations will need to be adjusted to a factor of 1.25 meaning the electric radiators will need to be 25% more powerful to offset the height and added heat loss. Again, for a vaulted ceiling the calculations will be amended to a factor of 1.5 so, electric radiators will need to be 50% more powerful than a standard 3.5 meter ceiling. A kitchen needs to adapt to a constantly changing environment, as it is used as a social room with poor insulation in comparison to a bedroom or living room. A conservatory will have a very different heat loss and, regulations that need to be adhered to. Dwarf or low-level wall will stipulate the type of radiator used as they need to be low in height and more powerful than the standard room electric radiator. Specialist conservatory electric radiators should be used in this instance. The use of multiple radiators - you do not have to have just one radiator, if you have sufficient space, even with a small room as long as the wattage is correct multiple electric radiators can be used. A room is able to heat up much faster if multiple radiators are used.